The press and media centre at Old Trafford had to be vacated by 8pm, the chairs were piled up as the afternoon wore on and plastic sheets were laid down on the floor of the dining area. No, this wasn’t a particularly raucous afternoon among the assorted Roses press, but rather a clearing of the decks to allow the crew to move in to ready Emirates Old Trafford for the big gig from Indie Rock band The Courteeners on Saturday. As well as that there was the presence of a couple of helicopters flying around the local area for much of the afternoon – the suggestion being that they were filming for a TV show. You’re never short of something going on around here. Oh yes, there was also the cricket. 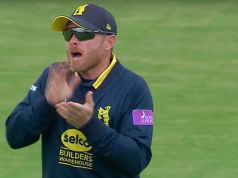 Day four of the Roses clash began with a draw looking like the likely outcome and, despite a fleeting Yorkshire attempt to force an improbable victory charge late in the afternoon, so it proved as the captains shook hands at ten to five. This wasn’t the kind of Roses spectacle that could be labelled ‘Rock N Roll’. 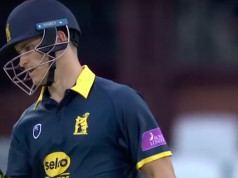 Much of the day could positively be described as easy listening, but a brief stint on the drums from Peter Handscomb threatened to get the pulses racing and invigorate the contest. The Australian’s blistering century came from just 77 balls and included 12 fours and one big smack for six to the short boundary. Along with opener Alex Lees, who made 62, they put on an unbeaten 153-run stand to guide Yorkshire to a lead of 193. But the two captains, Steven Croft and Gary Ballance, shook hands at 4.50pm with Yorkshire deciding that there was no chance of forcing the win. The final day of this match hinged upon whether Lancashire could avoid the follow on. They resumed 264-6, needing 35 to avoid having to bat again. Ryan McLaren and Stephen Parry guided them to that target with a 50 partnership. McLaren kicked on to make 84 when he was dismissed by Rafiq, but Lancashire’s lower order were to add substantial runs to the total. 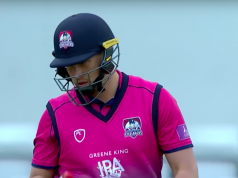 Tom Bailey made a 56-ball 40 while number ten Simon Kerrigan fell two runs short of his first-class best by making 59 from 63 balls. Even James Anderson hobbled to the middle, nursing his groin injury and with Liam Livingstone as his runner. The last three wickets were worth 115 as the Red Rose batted themselves into a position of safety. The rain that wiped out much of the second day of this Roses clash was ultimately responsible for forcing a stalemate. Despite Yorkshire dominating much of the contest, it’s Lancashire who emerge with 10 points compared to the White Rose’s nine. “To come out with a draw with one more point than them is slightly pleasing,” Lancashire captain Steven Croft said. “We’re a little bit disappointed because we got ourselves in a really good position. We had them 160-6 and that was an area we could have capitalised a lot more on. Lancashire remain unbeaten in the Championship so far this season, with three draws and a solitary victory at home to Somerset. Croft is happy with their form thus far and wants them to continue to be hard to beat. “I think it’s been really good for us so far,” he said. “The first two games we drew and we were on top for a lot of those games. “Coming into this year everyone thought it would be a tight division and that’s what we’re seeing I think. Hopefully we can keep being consistent and putting in performances. This won’t go down in the annals as a classic Roses contest. A draw was all-too-inevitable, despite faint hopes to the contrary on the final day. It will be remembered more for individual moments of brilliance, with four centuries in the match including that blistering Handscomb masterclass, a maiden ton for Jack Brooks and a 75th first-class hundred for veteran Shivnarine Chanderpaul. And it will be remembered for the 11th over of the match, when James Anderson hit the deck clutching his groin – one moment that served to define this meeting between the fiercest of rivals as it enters its 150th year.